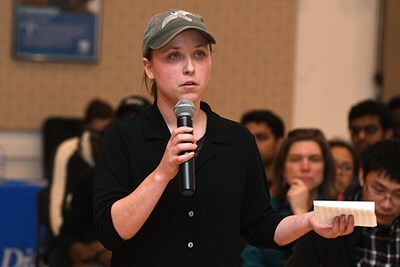 Sabrina Pederson was a speaker at the annual Climate Change Teach-In. When looking for clubs to join, students first need to ask themselves what impact they want to have. Are they joining something for self-pleasure or are they joining something to help a cause? When it comes to the Climate Change Coalition, both reasons fuel President Sabrina Pederson’s passion. “From five years old up until high school when I started working in this field, I knew that when I came to college I wanted to start fighting for Climate Change,” Pederson says. Formerly known as the Student Environmental Alliance, the Climate Change Coalition works to bring communities together to “promote sustainable practices and educate others on the importance of environmental issues – particularly those related to the consequences of climate change,” according to their mission statement. “We have been getting involved with activists on campus and solidarity groups in Lowell,” says Vicki Kurker, the clubs vice president. Some of these groups include the local 350 chapter and Better Future Projects out of Cambridge, Mass. The club plans on making their way to the Science March in Washington D.C. on April 22. “There is a group of students and faculty trying get UMass Lowell to arrange a bus to the March,” said Kurker. A lot of what the Climate Change Coalition is locally based, but they are trying to branch out and help on a more global scale. “It is great to focus on local campaigns but I think we are really trying to show support for the national campaigns as well,” says Kurker. The CCC brought students to the Dakota Access Pipeline rally over the winter. But the Climate Change Coalition is still focused on the effects locally as well as making sure the UMass Lowell community is informed. World Climate, a simulation game, is something the Climate Change Coalition values heavily. Much like Model United Nations, each group is representing a different country. The only difference is “that it is completely climate policy based,” says Kurker. “From that you learn the intricacies of how much effort it takes on a global scheme to address climate change, she says. The club has reached out to students who are both members and non-members of the club to participate in this game. “We plan to have a World Climate game of our own by the end of this semester,” says Pederson. The Climate Change Coalition is more than just a club to Pederson and Kurker, “it is an opportunity,” they say. “If we have a country that is divided as much as it is then we have the opportunity to take advantage of democracy and to speak,” Pederson says. The folks at the CCC believe climate issues are not just climate issues, they are social justice issues. Climate change effects an astronomical amount of people around the world and the work of a small club in a growing college is helping more than they realize. I am a proud graduate of Beverly High School and a senior at UMass Lowell majoring in English and minoring in digital media. In addition to being a staff writer and the Managing Editor for The Connector, I am also the Sports Director at the college's radio station, WUML. If you want to talk to me directly about any of my works, feel free to email me at Alexander_Salucco@student.uml.edu. Catch me every UMass Lowell Hokcey home game on 91.5 fm.